All of the posts under the "Cats" category. A few weeks ago, I had to say goodbye to Mac — my marmalade-cat friend of 14 years. He stayed as long as he could, refusing to let me know he had cancer. I found out when I ran my hand down his back, and he made a sound I’d never heard before. There was nothing to be done — they can’t cure carcinoma. 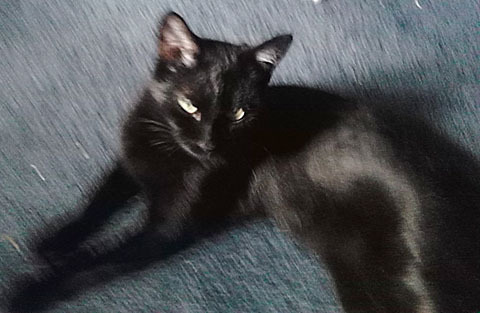 Two days later, I was adopted by a black kitten. I grew up with black cats, so all such moggies are friends. She has very big eyes, and her humane society name was Mercy. To herself she is…Herself. Like all kittens, she likes to run and stalk and climb and play. Her favorite toys thus far are neat little chase-me balls made from small strips of flexible cohesive vet wraps that are meant to protect horse legs. They bounce beautifully as they’re made of latex, and they roll in unexpected patterns. They also catch on claws and can be carried about in the mouth. And lost under the furniture. Of course. 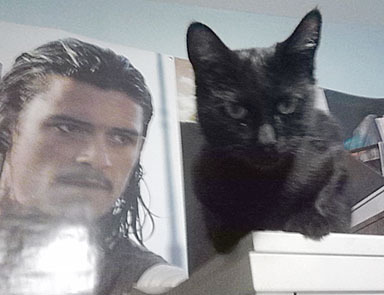 Herself likes to keep company with me when I’m writing, and she reminded me of Pangur Bán who was another cat companionioning another writer. From the 9th-century Irish poem written by an annonymous monk. Translated By Seamus Heaney. Mine to free the meaning pent. Books, silence, thought, my alcove. Child-plays round some mouse’s den. Bares his flank: Pangur pounces. Meaning back begin to yield. On the challenge of the page. Pangur springs, exults and kills. Answers come, I too exult. So it goes. To each his own. Pangur Bán has learned his trade. Solves the cruxes, makes a mark. This is Thorne. He’s 17 years old. These are plastic straws. They’re brand new. Years ago, we discovered Thorne had a thing for straws. If we left one unattended in a cup, he’d steal it and chew it flat over a couple of days. Some straws we brought home were thick and safe for the Thorney treatment. Most were too thin. They shredded between the power of his enthusiastic molars, and we had to watch sharp and soon separate Thorne from his joy to keep him from swallowing a piece of shattered straw. At the time Thorne came to us, a Korean couple ran an independent Discount Emporium a few blocks above the place I worked. It was nestled between a wedding rental shop and a check advance shark. Everything was only $1, and the store held all sorts of treasures, like wonderful Ceylon teas from Fortunes and Roya’s Tea Garden, iron tea-lite holders, and exquisite journals with tissue-thin pages boarded with silk. Best of all, the Emporium had straws hard enough to stand up to Thorne’s enthusiasm. I bought four bags when I saw them (200-count each) and wondered at the time if the straws would run out before he left us. Each little darling gave him multiple sessions of unchaperoned chewing pleasure–easy for us, safe for him. They flattened but never shredded, and we’d find mangled plastic worms abandoned throughout the house. Thorne accepted each straw offering with open joy, lifting up on his hind feet to take the straw between his teeth like a horse takes a bit. Each one seemed to contain an private adventure for him. 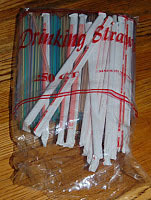 These are the straws that are left. The white ones are backups from Arby’s. Though both are safe for him to chew, Thorne would tell you the white ones are inferior, that no fast-food offering could possibly hold the same tasty pleasure as the Emporium’s. He will always prefer the colorful straws in their crinkly plastic package to bigger, boring, dignified ones in a plain white paper. Thorne died this week. The straws he left behind have made me realize that rather than rationing his joy to make his favorite stiff straws last in their crinkly plastic package (the sound of which always made him come running), I should have been offering him adventure after adventure as quickly as I could. As soon as he abandoned a flattened straw because all the goodie had been chewed out of it, I should have gone to the kitchen cupboard (too high for him to steal a straw for himself), crinkled the bag, and watched him come running for another adventure. Instead, I drizzled out his joy so slowly, he had to leave much of it behind. Thorne’s leaving has also made me realize that I’m also guilty of drizzling out my own joy. I hesitate and hide and save my dreams and goals for tomorrow or next year, thinking I’ll get to it when the time is right. But time never makes things right: we do. Unless I take my dreams and deliberately make them real in my life, before Death walks up and tells me, “Time to go,” those dreams will still be languishing in the crinkly bag of my psyche, waiting for the perfect moment I never made. This straw represents my goal of finishing the paranormal fantasy featuring Richard III that I have in progress. 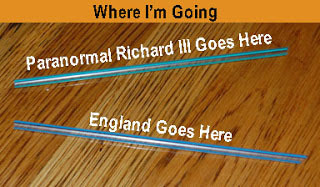 Another straw represents my dream of returning to England to visit Middleham Castle, to stay in the Cotswolds, and forty other adventures I let myself be talked out of having [mumble] years ago. The straws Thorne left behind are shouting for me to grab the goodies in life — not someday when the time is right, but right now, starting this moment. Pick up a dream, write down the steps it will take to get from here to there, and do them. Because the clock ticks on and neither Death nor any goody will wait for me. 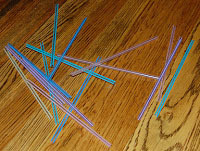 It’s my fault I rationed Thorne’s straws, his chewing adventures. It’s my fault I’m rationing my own dreams. I put the first Thorney straw on the wall next to my computer. Grinning, I sink my teeth into the first step to finishing my novel on Richard. 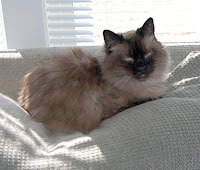 There’s no room in it for an appearance by a furry, opinionated Himalayan, but that doesn’t mean he’s not there with me, page by page. What straws do you want to do in your life?